As the great Forrest Gump once said, the National Trust is like a box of chocolates - you never know what you're going to get. 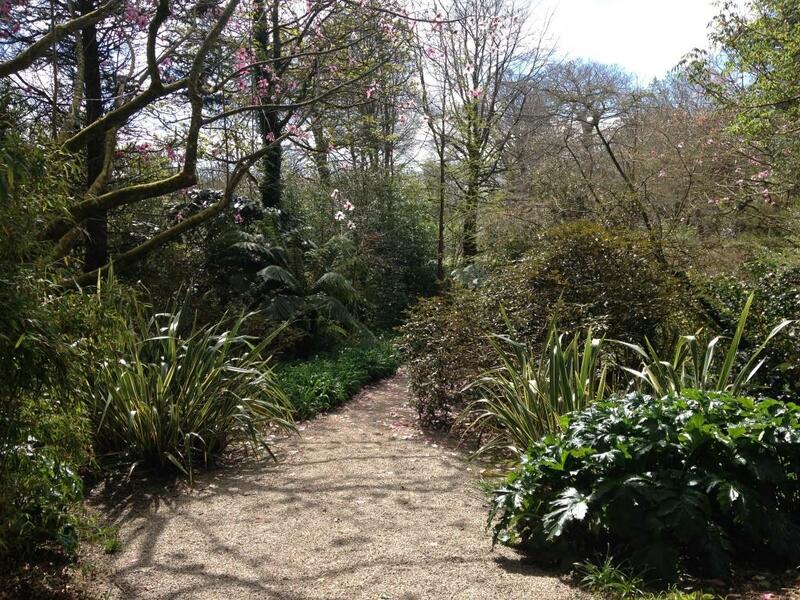 However, if you're heading to a place called Finch Foundry, you can probably safely assume that you're not going to see any antique lace or rhododendrons. I had absolutely no clue what the difference was between a foundry and a forge before my visit to Finch, but now I know: a foundry pours molten metal into moulds to create products. A forge heats metal so the items can be hammered into shape. What a great name for a village. 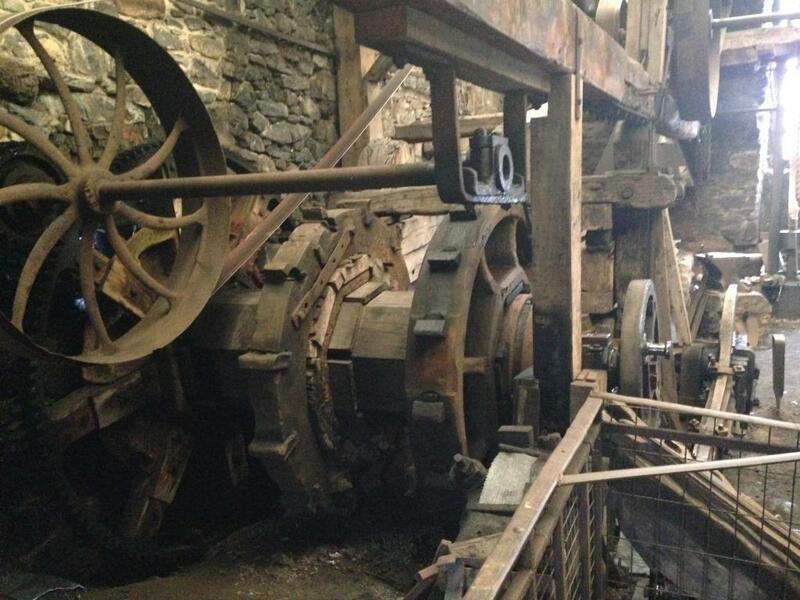 There have been water-powered mills in the area for over 700 years. When the Devon woollen industry collapsed, the mill became a forge in 1814 under the management of the Finch family. It kept going until 1960, when part of the building collapsed. Finch Foundry produced a huge range of edge-tools - I know what a shovel and an axe are, but I have absolutely no clue what a Cornish furze hook likes like, nor a Devon potato chopper. Anyway, the Finch family also made wheel parts, coffin boards, mallets...it's incredible to think that they produced 400 tools a day at their peak. 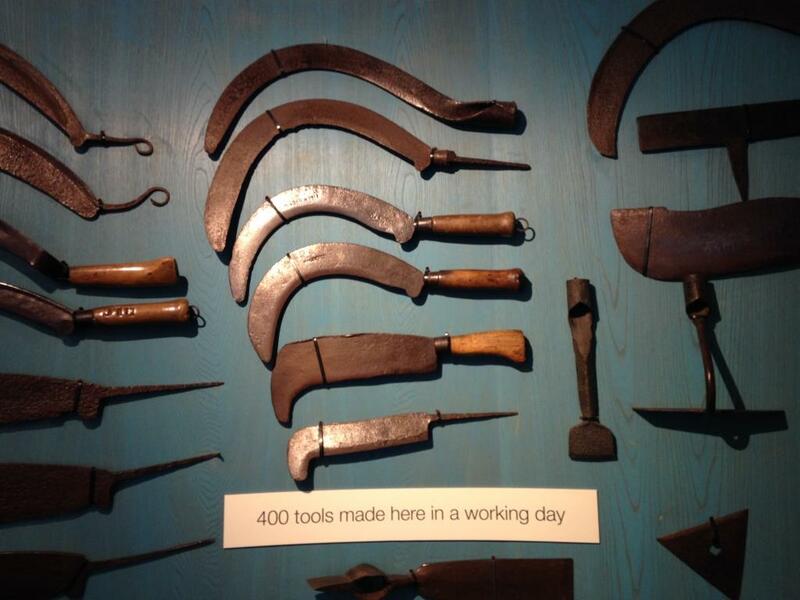 Of course, all of those tools had to be sold as well as made. In 1822, no cart was available to take Susannah Finch, wife of William, to Tavistock fair, so she walked the 20 miles with a quantity of bill-hooks, despite being heavily pregnant. When she returned, she had sold all of the bill-hooks and given birth to a baby girl. Scone Sidekick: "Who was the woman at reception talking about?" SS: "I've never heard of him"
Me: "You know the saying, 'Uncle Tom Cobley and all'?" Me: "It means, you know, everyone, as in 'he invited everyone to his party, Uncle Tom Cobley and all'?" Me: "I thought everyone knew that saying"
Me: "I'm getting the feeling that you're not very interested in Uncle Tom Cobley, possibly on account of the fact that you've never heard of him?" It all ends very badly, because the grey mare dies - and can you blame her, taking nine men to a fair - and she now haunts the moor. ANYWAY. 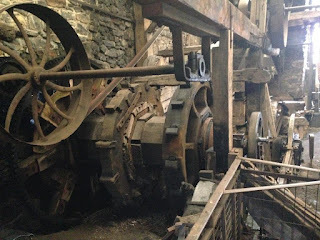 The connection with Finch Foundry is that a Tom Pearce (or Pearse) lived in Sticklepath, where his family owned a mill. He is buried in the Quaker graveyard behind the Foundry. Whether he is the Tom Pearce mentioned in the song is another matter, but let's not ruin it. Let's move on to the scones. 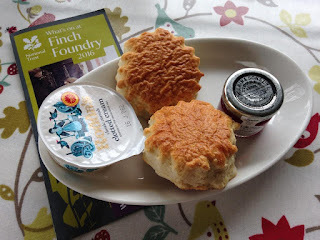 I got a bit unnecessarily stroppy recently with a fellow scone fan who criticised the scones at Finch Foundry for being 'unadventurous'. I hadn't been to Finch at the time, but I could guess that they didn't have a huge catering operation, and I'm a big champion of small properties that do their best (see also: Cherryburn and the River Wey). Now I've seen it, I can confirm that Finch Foundry has a weeny little tea room that does brilliantly to serve tea and cake at all. But still - it's not really worth getting annoyed about. 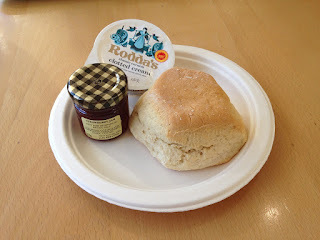 I must say that I was expecting Devon to be trouncing the other counties when it came to scones, but of six properties, only A la Ronde and Saltram have scored top marks. But I still have some big Devonian places to visit, so watch this space. If you are a doctor, a nutritionist, or my friend Kathy for whom I am being a bridesmaid in about 8 weeks' time, then you might want to look away now. Because this post marks the crossing of a line. It's the crossing of a line from a normal person with a nice little hobby of eating scones at National Trust properties, to a Bruce Bogtrotter-style glutton. Trengwainton Garden was the 7th National Trust property that we visited during our 48 hour Scone Blogger Spring Tour of Cornwall. 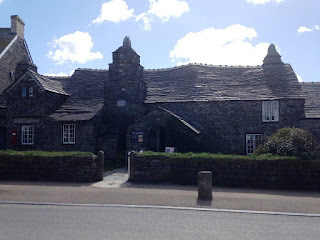 We'd had THREE scones on the previous day (at Boscastle, Trerice, and Trelissick) and then another one at St Michael's Mount at 10.30 in the morning before we got to Trengwainton. I was up for the challenge, of course, but the Sidekick said no. He insisted we share a cream tea rather than have one each, and boy was I grateful to him when I realised that a cream tea comes with two scones at Trengwainton. The good thing about Trengwainton is that, as the name suggests, it's a garden. This meant a bit of walking about, although I don't think there is a garden big enough in the world to allow the calories of 5 cream teas to be walked off. We tried though. But back to the scones. 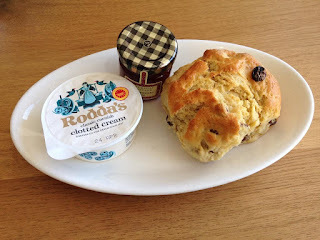 We had loved the cafes at Trerice, Trelissick, and Boscastle, and the scones had ALL scored top marks. Surely Trengwainton couldn't deliver the goods again? Readers, the scones were spectacular. If they had been in any way subpar, we'd have stopped eating. But they were perfect - light, fluffy, fresh and delicious. The cafe was lovely as well. Cornwall knows what it's doing, people. You'll be relieved to hear that we had to call it a day scone-wise after Trengwainton. We made the flawed decision to venture off the National Trust map and go to Land's End, which was a complete disappointment. But we'll be back on course soon, heading for property number 129. I just need to visit the gym for about 300 hours first. St Michael's Mount is the 13th most popular National Trust property, which is AMAZING considering it's in Cornwall and only 14 miles from Land's End. 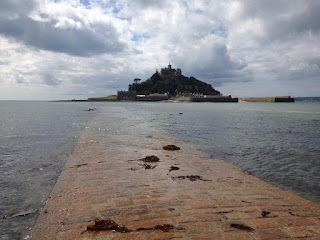 I had seen loads of pictures of St Michaels' Mount, but nothing quite prepared me for the first glimpse as we approached - it's literally breathtaking. 1. The Mount is 275 million years old! As everyone knows, St Michael's Mount was created when the Cornubian Batholith was formed following the cooling of magma. 2. It was once called Ictis (probably)! 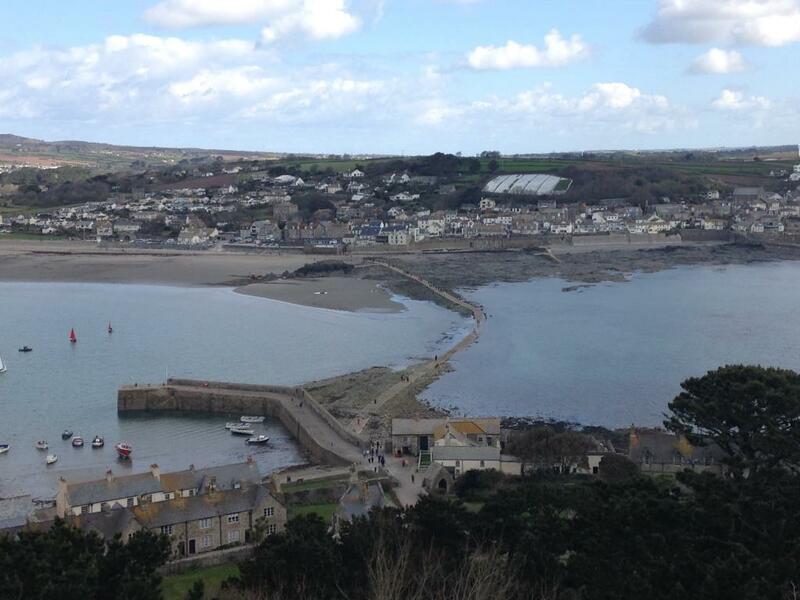 It's likely that people have lived on the Mount since the Stone Age. In the 1st century BC, a historian described how tin created in Ancient Britain was taken to a tidal island called Ictis where merchants would buy it and transport it over Europe. There has been much debate about where Ictis is, but SMM is the likeliest candidate. 3. It was once owned by Mont-St-Michel! I had to write an essay about Mont-St-Michel for my English GCSE. My teacher made me write it three times but it was still rubbish and I got a really bad mark. 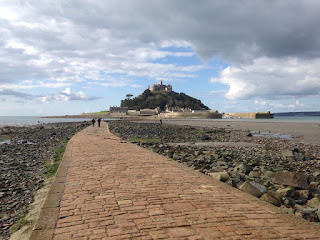 And now I know why; to this day, I thought that Mont-St-Michel and St Michael's Mount were the same thing. This is despite me spending several weeks in 1989 writing about a monastery in Normandy, while I knew that SMM was in Cornwall. ANYWAY. After the Norman invasion, SMM was given to the monks of Mont-St-Michel, so I was kind of right. 4. The church is the oldest part of the building! The church was consecrated in 1144 and it's still there today. 5. It was once owned by Syon Abbey! Henry V transferred SMM to his Bridgettine convent of Syon Abbey in 1414. This probably means nothing to most people, but it caused major excitement among the Scone Sidekick and me, as we live in Isleworth, home of Syon Abbey. Sadly Syon Abbey has gone, but we DO still have the UK's second largest sewage works. 6. The wife of Perkin Warbeck stayed there! Perkin Warbeck claimed to be one of the Princes in the Tower, and raised an army in Cornwall to claim the throne from Henry VII. 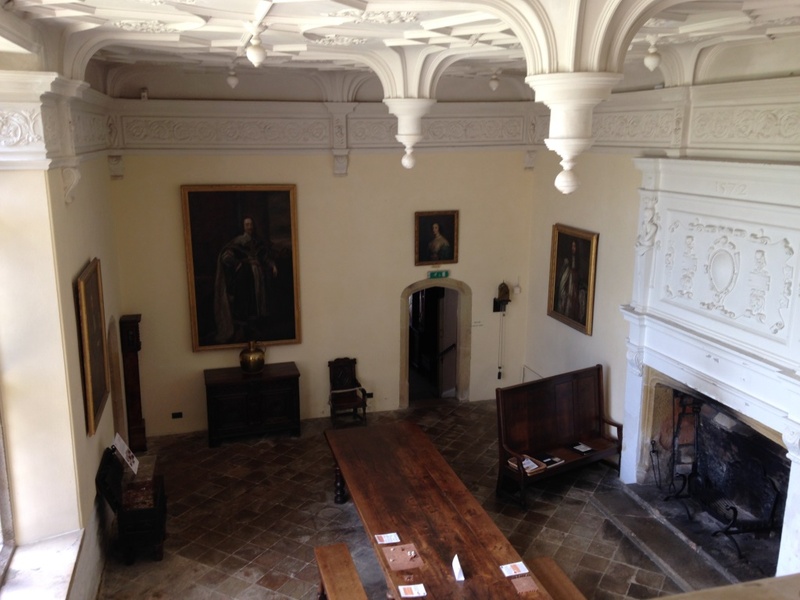 Mrs Warbeck stayed at SMM for safety in 1497. Perkin finally gave himself up as an imposter - the guide book doesn't say what happened to him, but I don't suppose he was allowed to go home and forget it ever happened. 7. The Aubyns arrived in 1659...and they'll be there until 2953! 8. It has survived earthquakes and tsunamis! The Great Lisbon Earthquake of 1755 caused a 3 metre tsunami in Cornwall, which severely damaged the harbour of SMM. The Mount also survived an earthquake in 1275. 9. It has a causeway! 10. The scones aren't home-made! 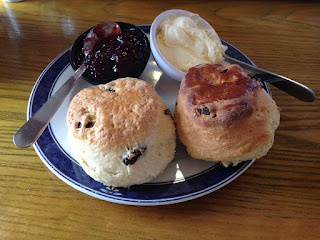 I don't think the scones at St Michael's Mount were home-made. They also had that squidgy texture that comes after a visit to Mr Microwave. But they were tasty and the tea was great, as it always is at the NT. I'm not surprised that St Michael's Mount is so popular - it must be in the top three most beautiful NT properties and I can't recommend it highly enough. 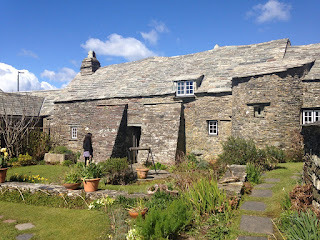 If you had to pick one National Trust property that sums up Great Britain, it would surely be Tintagel Old Post Office. You've got Tintagel, the ancient, legendary home of King Arthur. And then you've got the Post Office, with queues stretching for several days across multiple counties, unless you need foreign currency, in which case you get served straight away (WHY?). I'm joking about the queues - Tintagel Old Post Office was a post office in Victorian times, so it's not actually open for business today. I did see a man in a stovepipe hat who'd been waiting for a passport application form for 130 years though. Anyway. There's no tea room at TOPO. But that's the beauty of Cornwall - you're never far from a scone. Which made a nice change for me and the Scone Sidekick, as we live in London where you're famously never far from a rat. We then headed onto enemy territory; Tintagel Castle, which is run by English Heritage. Now, I am extremely defensive of the National Trust. If someone says to me "we went to X property and it was SO EXPENSIVE to get in! £9.80 each for me and Dave and £6.50 for little Kanye! One of us could have gone to Legoland for that! We had to leave Dave's mum in the car." I always think "WHY DIDN'T YOU JOIN?! 500+ properties for a few pounds a month is a bargain! And to think that you're an accountant - I'm not letting you anywhere near my finances." Having said all of this, if you want to meet the Gordon Gekko of the heritage world, go to Land's End (not an NT nor an EH property) where you have to pay £9.95 minimum if you want to have your photograph taken at the famous sign. Anyway. 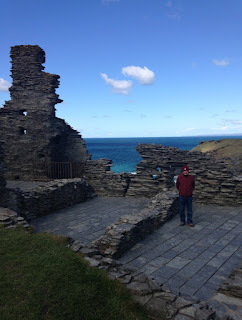 Tintagel Castle is well worth a visit. It was built in 1230 by Richard, Earl of Cornwall. Tintagel had been linked to King Arthur since the 1100s, when Geoffrey of Monmouth declared that Arthur had been conceived in Tintagel. It's now a ruin and you'll need a bit of energy to climb up there but it's impressive. I don't know about you, but I have a mortal dread of mispronouncing place names when I am actually in that place talking to a local. It's not so bad if you get it wrong in front of your own friends. You might say; "I'm going to Yosamight National Park next year." And if your friend is a true friend they will either say "Wow! That's great. I thought they pronounced it Yo-sem-it-ee though? I might have got that wrong," or "Wow! DAVE! Guess where Sarah is going next year? YO-SEM-IT-EE!" But it's really not OK to get it wrong in front of a local. I have laughed at too many Americans asking for directions to "Lo-og-borrow" (that's Loughborough to you and me). Thanks for that, Wikipedia. I'm glad to know Trerice is pronounced Tre-rice and not, you know, Lu-ton. So I had to rely on the usual fall-back plan of getting the local to say the word Trerice first. Luckily the woman at the reception desk obliged. I think it's called Truh-RICE as in rice pudding. Or maybe she too had looked it up on Wikipedia and didn't know either. But what about the all-important scones? 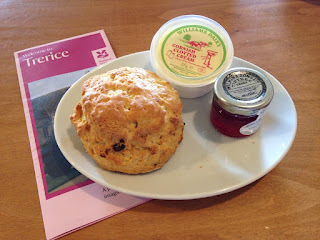 We'd already had a fantastic scone in a fantastic NT cafe at Trelissick before we got to Trerice. The Scone Blogger prophecy foretells that thou never geteth two excellent scones in a row, so my expectations were not high. But Trerice delivered: the cafe was lovely and the scone was absolutely delicious. It was a unanimous five out of five from me and the Scone Sidekick. It also marked a hat-trick of scones for Cornwall, what with Lanhydrock also scoring 5 out of 5 back in October. 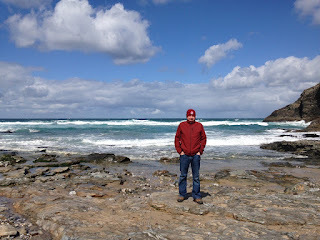 I spent many a weekend partying in Newquay when I was 18 and so we drove there very quickly to see how it looked today. I was genuinely expecting to feel pangs of sadness for my youthful days, but while I remember them very fondly, I wouldn't go back there for all the clotted cream in Cornwall. 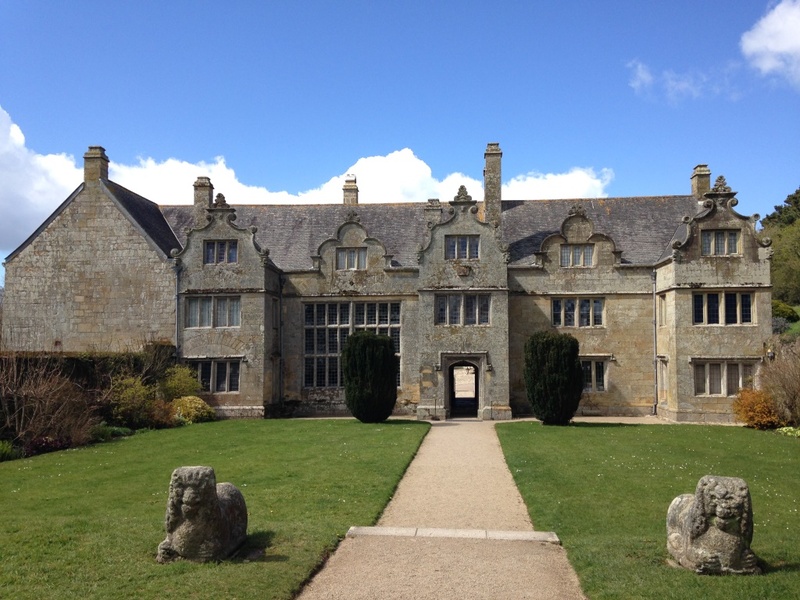 Give me the tranquility and the scones of Trerice any day. I am all too aware that this blog is a bit biased towards National Trust houses. That's where the scones tend to hang out. But the Trust also owns woodland, coast, heath, farmland...hundreds of thousands of acres of beautiful land that would be ruined if the NT started building cafes on top of them. 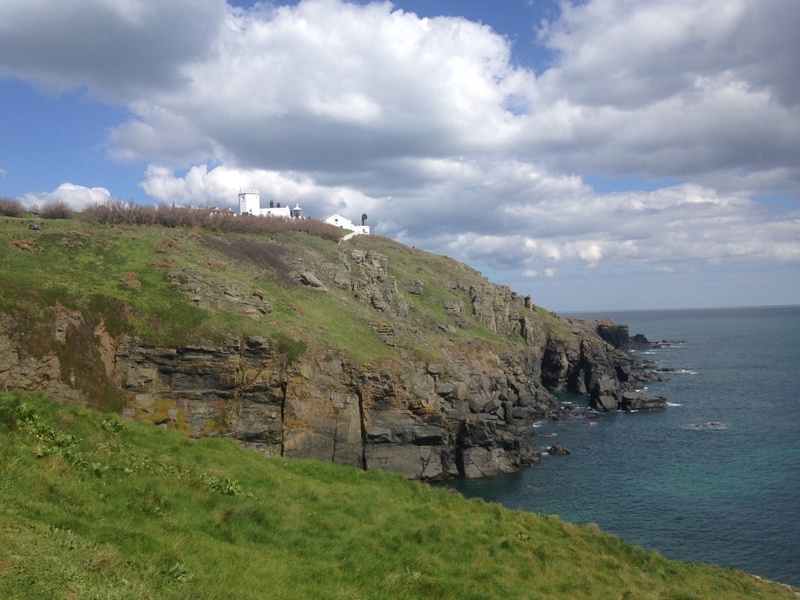 So I decided to stop off at Chapel Porth today, during the Scone Blogger's Spring Tour 2016 (Part 2), even though I was doubtful of any scone opportunities. 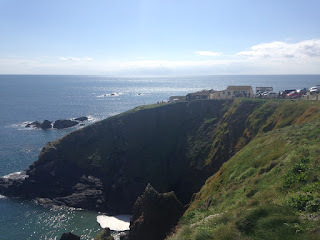 And I'm very glad we did, because we got to wander around a beautiful rocky little cove. It was only when I got back that I realised we'd visited during high tide - at low tide it's a big sandy beach. and coat off and make it look like it was baking hot, but he refused. 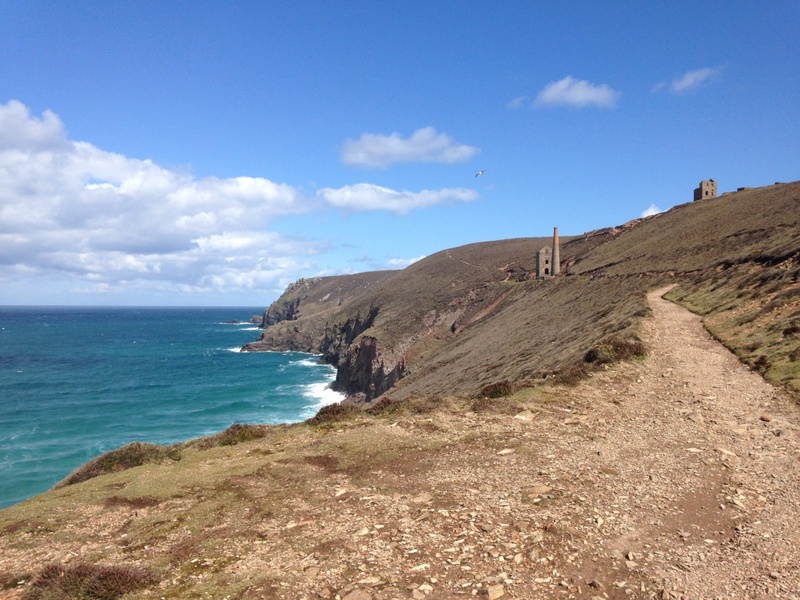 Chapel Porth is near to St Agnes, which was a mining community for 400 years until the 1920s. There were 100 tin and copper mines in the area. 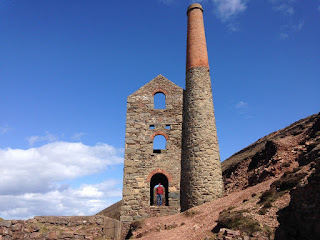 One of those mines was called Wheal Coates, which opened in 1802 and had three engine houses by the time it closed in 1889. The Towanroath Pumping Engine House was built in 1872 and it's still there today - it's a very pleasant half mile walk from the beach. I didn't think I could love the National Trust any more than I do, but today I discovered that they organise the World Bellyboard Championships that are held at Chapel Porth. 2016 is a fallow year, according to the brilliant website, to "allow the waves to replenish". 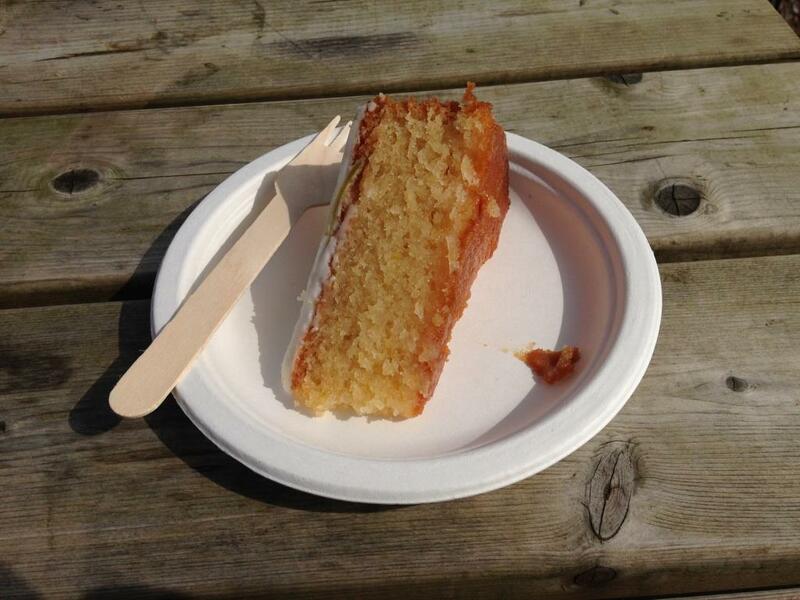 And as if that isn't excellent enough, they have a 'cake-off' as part of the event. Speaking of cake, there's a little tea kiosk selling sandwiches at Chapel Porth but I couldn't see any scones and I didn't ask if they had any - Richard Nixon would have slept a lot easier at night if I had been the investigative journalist working on Watergate, I tell you. 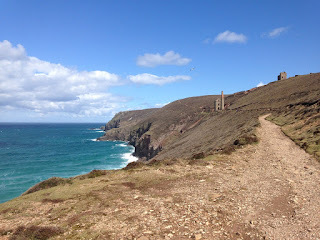 But scones or not, Chapel Porth is beautiful and well worth a visit. I was watching Countryfile just before Easter when I noticed a tweet: "Has anyone else working at the National Trust just seen this week's weather forecast and had to take a big gulp of wine?" It made me laugh, but it also made me wonder what the worst case scenario was for NT employees over Easter. Four days of rain and no visitors? Four days of sun and eight million visitors? Or (and this is what probably happened), one day of sun and eight million visitors, followed by three days of rain and no visitors? 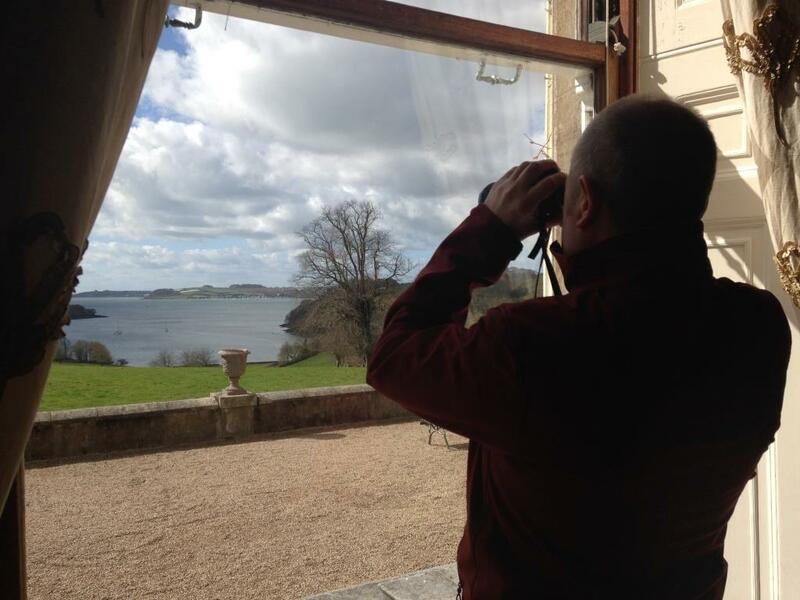 Today at Trelissick in Cornwall I realised that all NT employees probably have one eye on the weather at all times, but the ones that really lie awake at night worrying are the ones that are responsible for a newly acquired property. Properties that have been owned by the NT for years have already been through the worst of the weather - the storms of 1987, torrential downpours, massive snowfall etc. And although I'm sure they all have their ongoing problems, the NT knows them well and is able to prevent things from falling apart. But a new property like Trelissick House brings all sorts of unknown dangers. All the due diligence in the world can't prepare you for Storm Katie and half the roof blowing off. 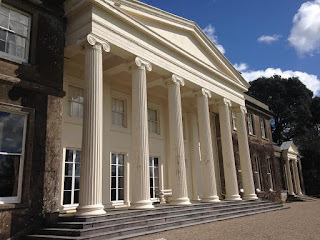 In fact, Trelissick has only had a few issues so far: some chunks fell off the portico, so they're hastily raising funds for that. And the solarium was shut due to some panes of glass being blown in, so they're trying to fix that as well. However, it must be like that Whack-a-Mole game, where every time you smack a problem down with your hammer, another one pops up. Ida became a Conservative MP in 1931, defeating Oswald Mosley to win her seat. She was also a second cousin of Florence Nightingale and was married to a bigwig at the Spode pottery works. I really liked the house - it's a bit shabby in places and so you get a real sense of what it must have been like to live there. And I'll tell you what else was stunning: the scones. Trelissick was the 120th stop on the National Trust Scone Odyssey, and we've seen a lot of cafes and eaten a lot of scones. 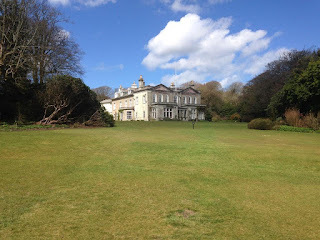 But the cafe and scone at Trelissick were right up there with the very best - it was a lovely place, and the scone was fresh and light and really tasty. The Scone Sidekick was also very taken with the retractable awning that Trelissick has installed over its outdoor seating area. I think he's now waiting for Storm Keith, or whatever it'll be called, to come and knock down our non-retractable one at home so he has an excuse to copy it. The first time I saw Boscastle in Cornwall it was being washed into the sea. I hasten to add that I wasn't actually there - I was 200 miles away watching on TV as cars and buildings were carried off after a catastrophic amount of rain fell on 16 August 2004. It's an absolute miracle that nobody died. 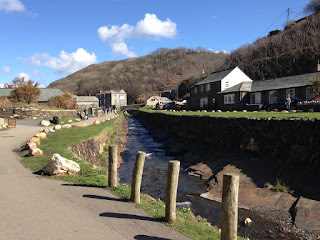 Boscastle could easily be called National Trustville. The NT owns over 300 acres of land, including the harbour, the river, roads, bridge, and several buildings. A strange haze was hanging over Boscastle when we arrived. "It's like that film," said the Scone Sidekick. "Poldark?" I replied. "No, The Wicker Man." I knew exactly what he meant, though. And the eeriness continued when we found the Museum of Witchcraft - this isn't owned by the NT, however. Like me, you have probably often thought that it would be AMAZING if there was a National Trust Scone Hotel, or Hotel Sconeifornia as I had already named it. Guests could learn to bake NT scones if they wanted, or they could just eat them. Anyway, today I discovered that it ALREADY EXISTS!!! I know! The Trust owns some holiday apartments in Boscastle and they're located in the SAME BUILDING as the visitor centre/shop/cafe! You couldn't get any closer. And it got even better. On arrival I found a note saying "enjoy a complimentary cream team in our cafe." So off we went. The NT cafe itself is lovely. It's cosy and comfortable with very friendly staff. 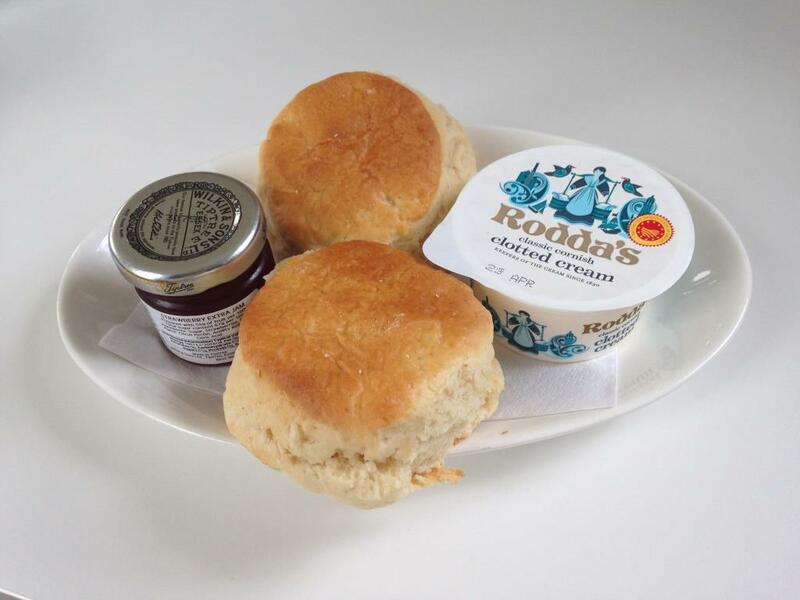 The Scone Sidekick spotted the paper plate/cup and wooden knife and his face darkened - he recently had a rare "this is like McDonald's" meltdown in Greenway when presented with similar - but he loves Boscastle so he managed to stay calm. If there was an award for NT scone that did not look very promising but turned out to be first rate then the Boscastle scone would win it. I hacked into it with my little wooden knife and my heart sank - it looked more like a bread roll. But I ploughed on and was delighted to discover that it was absolutely delicious. It was light as a feather and very tasty. 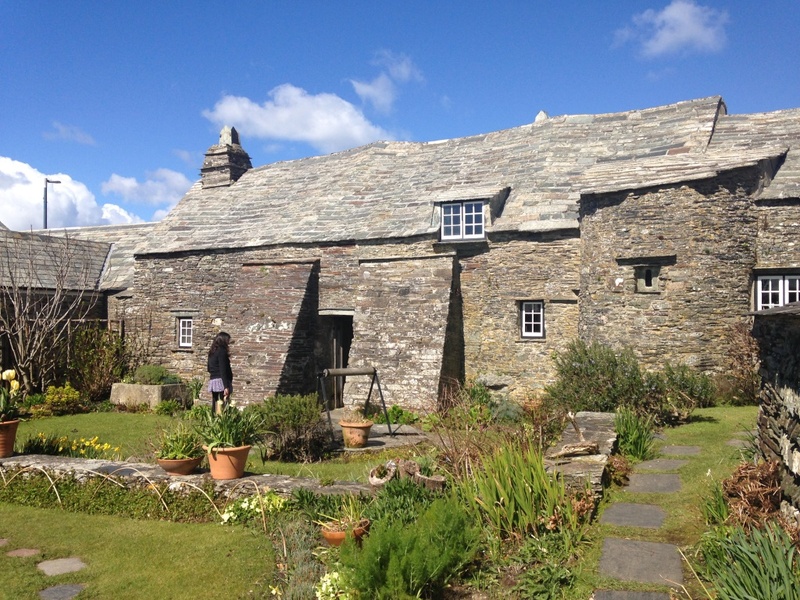 If every NT holiday home is as good as The Gaffer in Boscastle, then I can throw my passport into the bin and spend every future holiday touring the UK. I highly recommend it - book today (and I'm not being paid to say that). 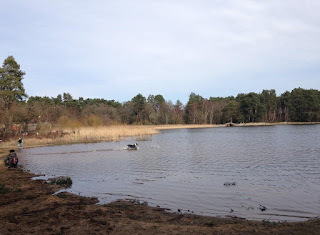 If the dogs of Great Britain were asked to name their favourite National Trust property, it would be Frensham Little Pond. I have never seen so many happy canines. And bear in mind that I once accidentally spent an afternoon at a dog show in Montana, where there were about 3000 dogs who should have been in their element. However, many of them were dressed up as hot-dogs or clowns and that seemed to cause a lot of bewilderment. Anyway, there were loads of unbaffled dogs today. I did see one big dog take a ball belonging to a small dog and the two sets of owners having a conference about this, but apart from that it was all fun and exuberance. 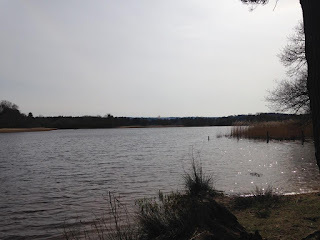 I really wasn't sure what to expect from Frensham Little Pond. It's not the most enticing of place names - there's a man down my road who has a little pond, and he has even helpfully put it in his front garden so anyone can see it. Why would I want to travel miles to see a little pond? But it's actually a very big pond (38 acres in fact) and it's a lovely place. 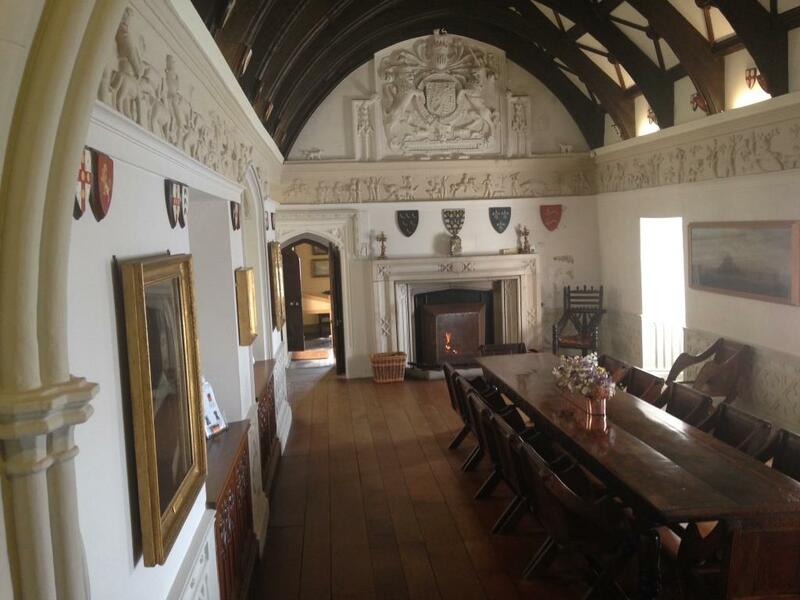 It was created in 1246 by the Bishop of Winchester, who wanted a supply of fish for Farnham Castle. It has remained pretty much the same ever since. It's also only 8 miles from Aldershot, and yet you feel as if you're at the coast, thanks to the sandy heathland. It's an unusual place. But onto the scones. I'm not 100% sure that there were no scones today. It's quite rare for an outdoor cafe to have scones and I couldn't see any. But I just didn't have the heart to ask the woman at the counter - it just felt wrong to bowl up and say "I see you serve all manner of lovely foods but I am going to be difficult and ask for something you don't have". 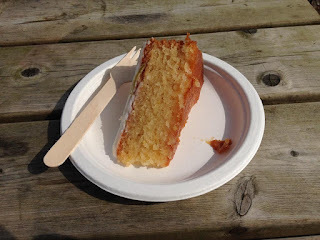 They did have very nice orange, lemon and lime cake though, so I had that.